I'm often asked where to eat and buy seafood. Here are places we locals like. Seafood. Right off SB bridge right in front of you at the stop sign is one good place next to Crabby Oddwaters, same building, is Bill's Seafood with a good selection of local fish. For the best Grouper, Sheffields Seafood and Grocery store. Go over OIB bridge and on your left are some shops, Sheffields is the gas station, go through the store, fish is in the back. Very fresh Grouper. As for eating seafood, sure there is always Calabash in town places but to us, way too much fried. Twin Lakes, almost under SB bridge, by the ICW, has really stepped up there quality these past years. We ate there once, long time ago, and was terriable. Today, good food and you can have fish cooked just about any way. Don't stuff yourself with Hush Puppys. They make great Martinis and good selection of beer. Over at OIB try Sharky's for lunch and dinner. Their grouper sandwich is great. 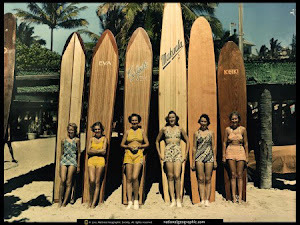 Nice collection of surfboards, few I wrote long time ago. One of Blind Dogs is usually hanging there, right at the entrance. 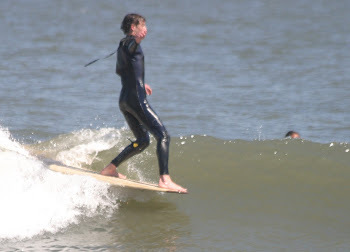 Ray Harris runs Sharkys, good surfer and his son, Knox is one of the worlds top rated surfers. Breakfest: Forget it. That is what we lack most around here good place to have early morning food. Coffee...and Bagles, that's another story. Mavericks Java is almost under SB bridge, right next to our fire station. Jenny is the tall gal that runs the place with her mother and father. Great coffee and a wine selection that is probably the best around. Not expensive but every one we have sampled has been great. Pizza. Only place around to have good, really good NY Brooklyn style pizza is Joey'os up on 179 heading towards OIB. Not open monday but rest of week from 4 to later. LaCanina next to Food Lion is good but expect a wait. Fibber McGees has good pub food but don't expect Irish meals...yeah go figure. Now if you really want one excellent awesome meal Brentwood in Little River, little hard to find, just keep looking on your right side for their white sign, it's a house set back one block from 17 as you head towards North Myrtle it is 4269 Luck Ave 843 249 2601. Their fixed price dinners are awesome and get the wine paring with it. Not inexpensive but good food like this isn't. Eric will answer your phone call, Frenchman and great chef. Bagels there is only one place, Sunset Beach Deli and Bagels. Go over to Food Lion, turn left onto 904 to next stop light/ 179 - Old Georgetown Road, there's a big gas station there, bagel shop is tucked in behind there in that strip mall. Great bagels and great coffee. And you can bring your dog, just sit outside. If you see a couple with white/beige about 60 pound dog, that's Adrienne and I. Usually there on Sunday mornings. They also have good breakfest fixings. 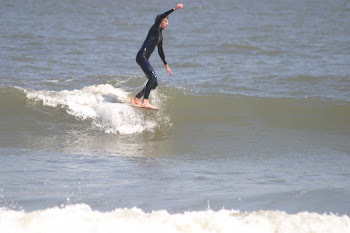 Surf shop is OIB Surf and Java up next to Lowes Food in OIB right off of 179, just before OIB road to bridge. Jessy is great surfer and surfboard shaper. Good coffee and great selection of surf clothing and goodies. For anytime: Sunset Slush on 179 or OIB or SB offers the best Italian ice type cones. Mango with vodka isn't too bad but I really didn't say that. For ice cream, nothing beats Calabash Creamery. They are always busy but well worth the wait. Nice ice cream cakes for parties. My favorite is Turtle Tracks. They, as do many of the above places, hire local kids for summer staffing.